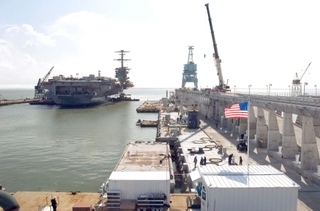 NEWPORT NEWS, Va., May 11, 2007 (PRIME NEWSWIRE) -- Northrop Grumman Corporation (NYSE:NOC) has completed the dry dock portion of work for the USS Carl Vinson (CVN 70) five days ahead of schedule. The carrier is undergoing a refueling and complex overhaul (RCOH) at the company's Newport News sector, the nation's sole designer, builder and refueler of nuclear-powered aircraft carriers. Tugboats moved the carrier from dry dock to a shipyard pier on May 9, where it will undergo final outfitting and testing. "Successful completion of the dry dock work and the transitioning of the ship back into the water signifies we're nearing the half-way point of this enormous undertaking and that we are one step closer to bringing the USS Carl Vinson back to life," said Ken Mahler, vice president of aircraft carrier overhaul programs for Northrop Grumman's Newport News sector. "Our team of outstanding shipbuilders, USS Carl Vinson sailors, and government teammates are performing exceptionally well on this challenging project. We are working together and driving continuous improvements at all levels of the program to continue our strong performance to ensure we return the USS Carl Vinson to the fleet on time and on budget." Approximately 3,700 employees are working on the project, which includes refueling the ship's reactors as well as extensive modernization work to thousands of compartments and hundreds of systems. There are approximately 2,700 sailors currently assigned to the ship, and many have been contributing directly to the overhaul work effort. "Team Carl Vinson achieved an important milestone in the goal of bringing this aircraft carrier back for 25 more years of service to the fleet," said Capt. Ted Carter, commanding officer, USS Carl Vinson (CVN 70). "We now must move forward with a collective and sustained team effort to achieve our ultimate goal of completing RCOH on time and at budget. We're not just rebuilding material; we're building a new era for our ship, our people, and our legacy." Work accomplished while the ship was in dry dock includes removing, refurbishing and reinstalling the propellers, propeller shafts and rudders; painting the carrier's massive hull and replacing thousands of valves, pumps, and piping components. Shipbuilders also removed the top two levels of the island and mast and replaced it with a reconfigured island structure and new mast to provide enhanced capability. Work through redelivery to the Navy in 2009 includes installation and testing of combat and electronic systems; overhaul and energization of electrical distribution systems; overhaul, repair, and testing of propulsion plant systems; habitability upgrades and modernization; crew move-aboard; and installation and testing of aircraft launch and recovery equipment. USS Carl Vinson refueling and complex overhaul is scheduled to last more than three years and will be the ship's only RCOH in a 50-year life span. Vinson arrived at the Newport News shipyard on Nov. 11, 2005 and is the third ship of the Nimitz class to undergo this major life-cycle milestone.